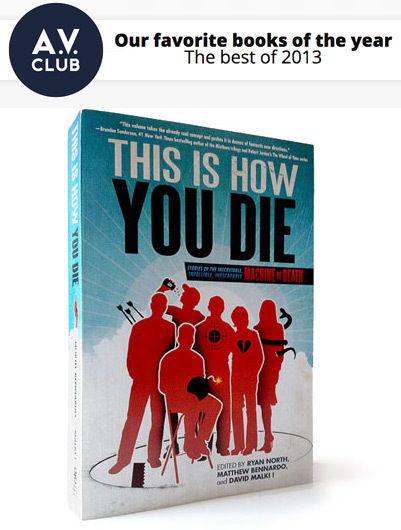 THIS IS HOW YOU DIE is an AV Club Favorite of 2013! + “ROCK AND ROLL” podcast! …This follow-up, again consisting of short stories and other works exploring the possibilities of the device, irons out every flaw from the first collection, while pushing the stories to much more diverse extremes. There’s an impressive amount of color and genre range in these stories, but also a touching amount of humanity: The theme keeps pushing the individual authors back toward the idea of understanding and accepting their mortality. Some of the stories are funny, some are odd, and some are brilliant, but they’re all deceptively smart about exploring all the ways individuals come to terms with death. AW SHUCKS. Thanks, Tasha! We like it too. The worst part is that I'm pretty sure I'd get awkward looks from anyone if I said I wanted a copy of This Is How You Die aloud. 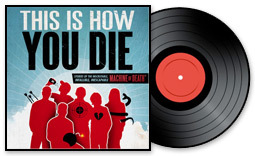 TRUE FACT OF SCIENCE: This Is How You Die makes a great gift this holiday season! And also as an audiobook, with the stories read by four alternating narrators! Grand Central has kindly given us permission to post one of the audiobook stories on our podcast. “ROCK AND ROLL”, by Toby W. Rush. “So how many of Stephen’s concerts have you been to, Amanda?” Julie had a devious sparkle in her eye. Amanda felt a knot form in her stomach, realizing that she couldn’t answer the question honestly and still maintain any pretense of holding the upper hand. She resigned herself to her place, knowing at least that Stephen would not want her to lie about it. “This is my first,” she replied, mustering her confidence. “But I’ve been a huge fan since Death by Rock and Roll.” She made sure to name-check Stephen’s first album, if only to prove her devotion. Toby W. Rush is a professor of music theory by day and an author by night, or at least whenever the kids are in bed and only after the dishes are done. He lives in Centerville, Ohio, where the drivers are friendly and the wi-fi is strong. By the time you are reading this, he hopes to have scraped something together worth discovering at tobyrush.com. or at @tobyrush. In the book, “ROCK AND ROLL” is illustrated by Meredith Gran! Comments Off on THIS IS HOW YOU DIE is an AV Club Favorite of 2013! + “ROCK AND ROLL” podcast!